On December 7, 2001, Manitoba Hydro filed Environment Act Proposal Forms to initiate a formal process under the Manitoba Environment Act for the 200-megawatt Wuskwatim Generation Project and the Wuskwatim Transmission Project. The generation station site is on Wuskwatim Lake and Burntwood River. According to Manitoba Hydro, in order to arrive at a planned in-service date of 2009, construction for the proposed Wuskwatim projects had to begin before the winter road season (January-February) in 2004. See Manitoba Hydro web site for general scheduling details for these projects. This schedule required Manitoba Hydro to secure an environmental licence for the two proposed projects by December 2003. This has not occurred, and the in-service date for Wuskwatim has been pushed back to 2010 (at the earliest). Environmental license, and federal permits were issued in June 2006. In January 2002, the Government of Manitoba announced there would be Clean Environment Commission (CEC) public hearings in accordance with subsection 6(5) of the Environment Act for the Wuskwatim projects (see page 3 of the final EIS guidelines). These hearings were triggered by a written reference from the Minister of Conservation. In April 2002, following Clean Environment Commission (CEC) public meetings, a joint federal/provincial regulatory committee issued final Environmental Impact Statement (EIS) guidelines for each of the two projects. For details, see Schedule 2 of the Guidelines for the Preparation of an Environmental Impact Statement for the Wuskwatim Transmission Project (April 26, 2002) and/or Section 2 of the Guidelines for the Preparation of an Environmental Impact Statement for the Wuskwatim Generation Project (April 29, 2002). On April 3rd, 2003, the Government of Manitoba cancelled its January 29th, 2002 promise to hold a public review process through the Public Utilities Board (PUB) with respect to the 'justification, need for the project and alternatives to' the proposed projects. See January 29, 2002 Manitoba government news release for details. The Government of Manitoba then mandated the CEC to also review the 'justification, need for and alternatives to' the Wuskwatim projects. Larger Image On April 30th, 2003, Manitoba Hydro released its EIS for the proposed Wuskwatim projects. 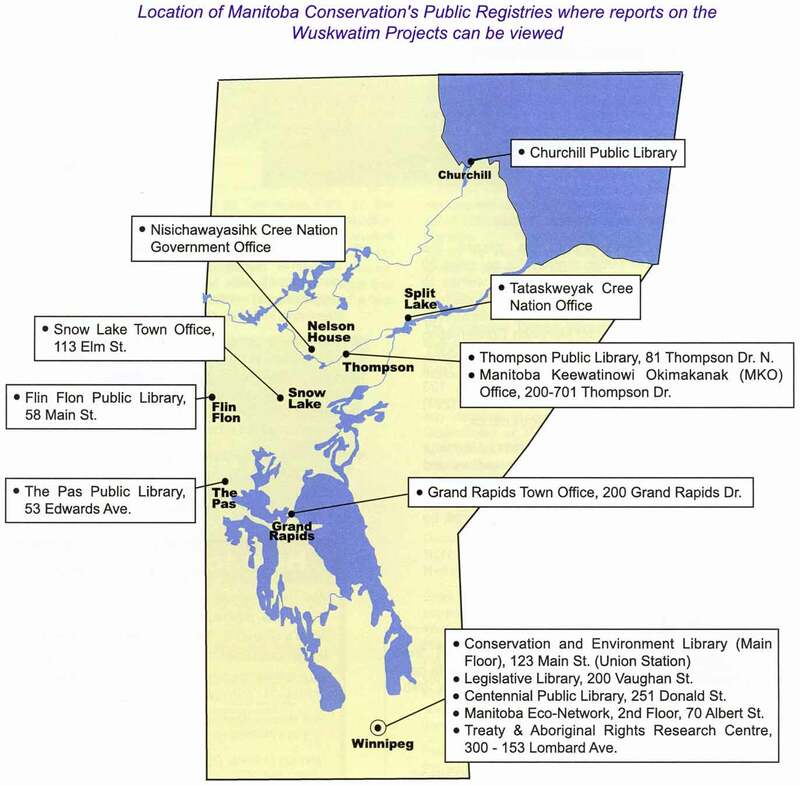 Manitoba Conservation then administered a 60-day public comment period. In response to comments received from the joint government Technical Advisory Committee (TAC), Department of Fisheries and Oceans (DFO), Manitoba Wildlands - CNF) and others, Manitoba Hydro released a supplementary EIS filing August 8, 2003. A further supplemental submission was filed in September 2003. On August 28th, 2003, the CEC released its draft schedule for the Wuskwatim hearings (scheduled for February-March 2004) as well as important pre-hearing activities. The Manitoba government also directed participant assistance funding for 15 communities, organizations, and intervenors to support their participation in the hearings. The Wuskwatim hearings began March 1, 2004 and concluded June 9, 2004. 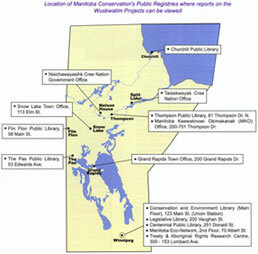 Energymanitoba.org contains detailed information on the hearings process, including links to transcripts, daily summaries, news coverage, evidence lists, presentations, schedules, and work products by Manitoba Wildlands and other public participants. The CEC released its report and recommendations from the Wuskwatim hearings October 4, 2004. Manitoba Wildlands assessed the CEC Wuskwatim report against our own technical work and analysis regarding the Wuskwatim review and hearings. Manitoba Wildlands was a participant in the review process for the Wuskwatim projects from the time Manitoba Hydro filed its Environment Act Proposal for the Wuskwatim Generation and Transmission projects in December 2001. Manitoba Wildlands became a funded public participant under the Participant Assistance Program ordered by the Minister of Conservation. Starting in 2002 environmental and community participants in the Wuskwatim reviews asked the federal minister of Environment to appoint a federal review panel for the projects, based on the failure of Manitoba to undertake a joint assessment with a joint panel for the Wuskwatim hearings. The high level of public concern about impacts from the Wuskwatim projects has continued. Aspects of the Cooperative Environmental Agreement between Manitoba and Canada were in question throughout the Wuskwatim review, assessment and hearings. In addition to licensing requirements under the Manitoba Environment Act and Water Power Act, Manitoba Hydro had to also fulfill requirements of the Canadian Environmental Assessment Act (CEAA). Federal officials with the Department of Fisheries and Oceans (DFO), which is the federal Responsible Authority (RA) under CEAA for the Wuskwatim Generation Project released the Comprehensive Study report for the Wuskwatim Generation Project, as required under CEAA in November 2005 (view Federal Comprehensive Study Report section). Nisichawayasihk Cree Nation (NCN) negotiated with Manitoba Hydro to be an equity partner in the development of the Wuskwatim Generation Project. An agreement in principle between NCN and the utility was signed in 2001. For information regarding this initiative go to the Manitoba Hydro web site. During the review of the Wuskwatim projects there was confusion as to whether NCN is in fact a co-proponent with Manitoba Hydro for this project. In October 2003 Manitoba Hydro and NCN signed a Statement of Understanding (SOU), as the next step towards the business arrangement regarding the Wuskwatim generation station. A backgrounder regarding this SOU agreement is available here. Negotiations for a final Partnership Development Agreement (PDA) regarding the Wuskwatim Generation Project between Manitoba Hydro and NCN was announced March 30, 2006. The Wuskwatim Project Development Agreement formalizes the Manitoba Hydro-NCN partnership, contracts and other components required for construction and operation of the proposed $1.3 billion Wuskwatim Projects. The PDA has been approved by NCN Council and the Manitoba Hydro Board of Directors. The Manitoba Government was not in attendance at the event to announce the finalization of the PDA. Transmission corridors and infrastructure are not part of the PDA. The PDA was subject to ratification by NCN members in a secret-ballot vote June 7 (advance polling) and June 14, 2006. Polling stations were in Nelson House, South Indian Lake, Thompson, Winnipeg, Brandon and Leaf Rapids. The June 7th & June 14th referendum vote required a double majority to pass. A majority of eligible NCN Members (both on and off reserve) must vote and a majority (more than 50%) of those voting must vote to approve the PDA. A 'No' vote would mean Manitoba Hydro would not proceed with the project. If the referendum results in support for the PDA, the project still requires provincial and federal approvals. The Project Development Agreement (PDA) for the Wuskwatim Generation Project between Manitoba Hydro and the Nisichawayasihk Cree Nation (NCN) does not include information required to complete an independent financial review of the agreement and an assessment of the financial implications for the Nisichawayasihk Cree Nation. In a letter dated June 9, 2006, the firm of Gardner Coombs Windsor Coombs Chartered Accountants indicates that they are "unable to complete a detailed financial review of this nature since the detailed financial assumptions are not included in the information contained on the [March 2006 Wuskwatim PDA] CD." The accountants also list the information that is needed yet not provided in the Wuskwatim PDA. In July 2005, an application was made by the Manitoba Hydro-Electric Board for a name change to its original June 2003 application for a Wuskwatim interim licence under the Water Power Act. Notice of this application for a name change was posted in the Winnipeg Free Press on September 10, 2005, with an opportunity for public comment until September 19, 2005. In September 2005, Nisichawayasikh Cree Nation began reviewing the Environmental Protection Plans for the Wuskwatim projects. These plans are not publicly available as of September 2009. The federal comprehensive study report for the Wuskwatim Generation project, authored by the Department of Fisheries and Oceans, was released November 2005. Several organizations and groups took advantage of the 30-day public comment period, which expired December 21, 2005, to submit comments regarding the CSR. Manitoba Wildlands, along with several others, reiterated a call for a federal review panel for the Wuskwatim projects, citing deficiencies in the CSR, the significant amount of unresolved public concerns, and various other challenges related to environmental effects, and the review process itself. Visit EnergyManitoba.org for history, evidence, presentations, etc, from the hearings. Several other organizations and communities provided comments on the CSR, see below. The people of the Nisichawayasihk Cree Nation (NCN) of Nelson House gave the green light to the Wuskwatim Generation project in a June 14, 2006 vote. According to media reports, more than 70% of the community's eligible voters turned out to vote, with 62% voting in favour of the deal in the referendum. The official signing of the PDA took place June 26 in Nelson House. The deal that NCN voted to approve will give the band the opportunity to buy as much as one-third of the generating station and share in one-third of the profits. It will also receive about $100 million in contracts for the construction process (which it will share with joint venture partners) and more than $10 million in training related to the dam. It requires NCN to invest $1 million immediately. At the end of the six- year construction period - likely about 2012 - NCN will then have to come up with the rest of the money it wants to invest. In a letter to the editor in the Winnipeg Free Press, Carol Kobliski, Spokesperson for the Justice Seekers of Nelson House criticized Manitoba Hydro and the Manitoba government for only printing 300 copies of the Wuskwatim project development agreement for over 4,000 Nisichawayasihk Cree Nation members to review. (These were not available until almost a month after the announcement of the referendum date.) Ms. Kobliski points out that with inflation, cost to build Wuskwatim will rise. As a partner, NCN will have to cover its debt and no one will guarantee NCN debt payments, while the Manitoba government and taxpayers will cover Manitoba Hydro's debt. As of June 21, 2006 official referendum results had not been publicly released or posted on the Internet. It was expected that, similar to other elections and referenda, results by day of vote (June 7 & 14), and by polling station (several around Manitoba) would be made available. Concerns regarding past problems with election procedures at NCN prompted the NCN Justice Seekers to request both provincial and federal government supervision of the vote. These requests were also tabled in the Manitoba Legislature on petitions with several hundred signatures. Community members filed appeals of the referendum process, and these were turned down. On June 21, 2006, both the federal and provincial governments announced that licences would be issued for the Wuskwatim projects. Both governments acted before the appeal period regarding the referendum balloting was over. See above. The generating station licence, to the Wuskwatim Power Limited Partnership, allows for construction, operation and maintenance of the generating station, and related dams, dikes, channels, control structures and infrastructure, including roads. The transmission project licence for Manitoba Hydro is for the construction, operation and maintenance of the Wuskwatim transmission projects (three transmission line segments, new transmission station developments at Wuskwatim, Birchtree near Thompson, modifications to existing Herblet Lake and Rall's Island transmission stations at Snow Lake and The Pas). An interim water power licence from Manitoba Water Stewardship was approved. The water power licence allows the Wuskwatim Power Limited Partnership to use water to operate the Wuskwatim generating station within regulated flows and levels. The Honourable Rona Ambrose, Minister of the Environment also announced in a June 21, 2006 press release that the proposed Wuskwatim Hydro Generation Project does not require further assessment by a review panel or mediator under the Canadian Environmental Assessment Act. The Minister referred the project back to the responsible authorities, Fisheries and Oceans Canada (DFO) and Transport Canada (TC), for appropriate action. The June 21, 2006 announcement by the Manitoba Government issuing environmental licences for the Wuskwatim Transmission and Generation projects also triggered appeal periods for the licences. The 30-day appeal period for the Wuskwatim Transmission Line Project (Class 2 project, 3 transmission line segments) closed July 21, 2006. A September 29, 2006 letter from Manitoba Justice informed Manitoba Wildlands and Trapline 18 that the licence appeals under Manitoba's Environment Act for the Wuskwatim Generating Station will be heard by Cabinet. The process includes submissions by appellants and responses from the proponents, after which Cabinet will consider information contained in the 'Appeal Book'. Subsequently, an October 6, 2006 letter from Manitoba Justice indicated that appeal of the Wuskwatim Transmission project licence would be subject to a similar process to generate submissions and responses, but the appeal will be heard by the Minister of Conservation (as the decision to issue the licence was made by the Director of Environmental Assessment and Licencing) and the Lieutenant Governor in Council will be asked to approve the Minister's decision in accordance with The Environment Act. Legal counsel from Manitoba Justice indicated that the appeal to Cabinet is a lengthy process. Appellants were not provided with funding or other support to participate in the appeal process, despite the commitment of time and resources required. Two appeals of the Generating Station licence were filed August 2, 2006, from Manitoba Wildlands, represented by director Gaile Whelan Enns, and from Trapline 18, represented by Greg McIvor. The appeals are based on issues consistently raised during The Environment Act review of the Wuskwatim projects and during the 2004 Clean Environment Commission (CEC) public hearings for the projects. It appears that required consultations with Aboriginal Peoples regarding the Wuskwatim projects were not completed. To view documents involved in the Justice Manitoba directed Appeal to Cabinet regarding environmental licensing for the Wuskwatim Generation Station please see EnergyManitoba.org. The Manitoba Cabinet dismissed two appeals initiated by Manitoba Justice following licence appeals under Manitoba's Environment Act for the Wuskwatim Generating Station (Manitoba Wildlands and Trapline 18). The decision followed Manitoba's 2007 provincial election. Wuskwatim dam and transmission infrastructure costs have skyrocketed, and are estimated at nearly 1.6 billion dollars. (April 2008). The original estimated costs were projected in the utility's environmental impact statement to be "very 'tight' or well-developed, with a 90 percent confidence" that they would fall within Hydro's cost range estimate. This cost range estimate was less than $1 billion for all generation station and transmission line costs. When the Manitoba Clean Environment Commission's environmental review of the Wuskwatim projects concluded in 2004 estimated costs had increased to $1 billion. In 2008, Hydro says cost of constructing the projects is nearly $1.6 billion - a 60% increase from 2004. Manitoba Hydro says changes to the Wuskwatim construction budget are a result of significant increases in cost of construction in Canada and a high Canadian dollar. The economics of the projects have been affected by soaring costs; Wuskwatim was originally thought to have a 10 percent rate of return (rate of profit earned from a capital investment). According to Manitoba Hydro, the rate of return is now "quite low," but implications of increased power sales have yet to be accounted for. Manitoba Hydro is encountering difficulties with construction of the Wuskwatim Dam and associated transmission infrastructure. The contract for site preparation work was awarded to Nebraska-based company Kiewet Corp. However, in October 2007, Manitoba Hydro confirmed the tendering process closed on the contract to build Wuskwatim without a single qualifying bid. Manitoba Hydro continued to discuss potential for Kiewet Corp. to undertake construction work for Wuskwatim, but talks broke down in January 2008, leaving Hydro without a company able or willing to build the 200-megawatt dam. As a result, in March 2008 the utility decided to break down construction elements into manageable pieces to encourage bidding. Two contracts will be put out for tender. The first is a smaller contract for the additional preliminary work expected to be awarded in May 2008. The second is a larger contract for the main construction work on the generation station. Manitoba Hydro President and CEO, Bob Brennan said that Hydro is still targeting 2012 for completion of the Wuskwatim project, which is a joint project with Nisichawayasihk Cree Nation. The Manitoba government announced April 17, 2008 Manitoba Hydro reached a tentative deal to provide up to 500 megawatts of power to the Wisconsin Public Service over 15 years, starting in 2018. The $2 billion deal would require construction of Conawapa, Keeyask and Wuskwatim dams as well as the BiPole III transmission line and a 60 km transmission line between Canada and the United States. 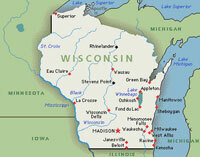 Manitoba and Wisconsin will require regulatory approvals regarding the power sale and construction of dams and transmission lines, including environmental licenses that involve public review. Canada's National Energy Board reviews such power sales. In Canada federal environmental assessment and permits are also required for hydro projects. Construction for the Wuskwatim Projects started August 2006. A 48-km all-weather gravel access road was built between Provincial Road 391 and the Wuskwatim site. The road provides year-round, all-weather access to the construction site. Construction of the road began August 11, 2006, and was completed late fall 2008. A 700-person construction camp, located north of the project site, houses workers building the generating station. Construction began in summer of 2007 and was completed fall 2008. Excavation for the principal structures commenced in December 2007 and was completed in February 2009. The work was done in two phases. Phase 1 preliminary excavation was completed in spring 2008, with approximately 650,000 cu. m of materials excavated. The upstream containment dyke and rockfill portions of the Stage 1 upstream and downstream cofferdams are complete. Phase 2 excavation for the principal structures and channels began in June 2008, with approximately 525,000 cu. m excavated. Phase 2 work also included the production and stockpiling of coarse aggregate materials for use in later phases of construction, including this season's concrete production. Phase 2 was complete in February 2009. Total excavations to date are approximately 1,178,000 cu. m of overlying soil and bedrock material. The project's spillway is a concrete structure 43 m in length with three bays that will serve as a diversion channel during construction of the main dam, and will provide flood routing for the reservoir during operation. The first concrete was placed in the spillway May 17, 2009. Installation of rebar and placement of concrete continued as part of the 2009 construction season. Construction of the transmission line from Birchtree to Wuskwatim has been completed. The transmission line construction from Wuskwatim to Herblet Lake is underway and is expected to be complete by March 2010. The clearing of right-of-way for the transmission line from Herblet Lake to Ralls Island has commenced and will be completed over the 2009/10 winter season. Line construction will take place over two winter seasons starting in 2009/2010 and finishing in 2010/2011. Installation of buildings at Birchtree and Wuskwatim switching stations is underway and buildings are expected to be complete by early September 2009. As noted on the Manitoba Hydro website, "Wuskwatim is the first Manitoba hydroelectric development ( generation station and transmission system)to be subjected to a public review and hearing under the Manitoba Environment Act. And it is the first to be subject to an environmental assessment under the Canada-Manitoba Agreement on Environmental Assessment Cooperation." No other Manitoba Hydro dams in Manitoba have been subject to a full environmental review and licensing process and there are no environmental licences in place for the rest of these dams. The Wuskwatim Power Limited Partnership (WPLP) was legally established in 2006, making Manitoba Hydro and Nisichawayasihk Cree Nation (NCN) official business partners. NCN has the opportunity to own up to 33 percent of the Wuskwatim Generating Station. NCN had significant input into the project's Environmental Impact Statement, including combining of traditional knowledge with scientific knowledge and working collaboratively on key aspects of the project, such as the choice of a low head design for the generating station. The low head design will produce 200 megawatts of power compared to 350 megawatts for a high head design, but reduces environmental impacts by reducing the amount of flooding to less than a half-square km (about 37 hectares) compared to about 140 square km for a high head design. The Wuskwatim Power Limited Partnership (WPLP) owns the Wuskwatim Generation Project. According to the WPLP website, "TPC, which holds NCN's shares in the project, has the option of owning up to 33 percent of the Wuskwatim Generating Station and to this point has invested $1 million in the project." The WPLP has posted monitoring reports for 2006-07 and 2007-08 that make reference to the licence requirements for Environmental Protection Plans for construction and operation of the construction camp and the generating station. These reports also detail monitoring activities. However, as of September 2009, the Environmental Management Plans themselves that direct site-specific protection of environmental resources during the construction and operation phases of the Wuskwatim projects are not posted on either Manitoba Hydro's website, the Environmental Assessment and Licensing page for the Wuskwatim projects, or the WPLP website. They are therefore still not publicly available. Manitoba Hydro made public commitments during the Environment Act licensing process that the various environmental management plans for the Wuskwatim projects would be public. At the end of July 2009, the Wuskwatim projects employed 976 people. Aboriginal peoples made up 29% of the total workforce (284 employees), with 40 of these Aboriginal employees (4% of total workforce) coming from Nisichawayasihk Cree Nation (NCN). No specific data is available regarding the proportion of employees who are from outside Manitoba. From August 13-16, 2009 protestors from Nisichawayasihk Cree Nation (NCN) set up a blockade, consisting of protesters, vehicles and logs, and blocked access to the Wuskwatim dam site. For a time, about 880 Manitoba Hydro workers were prevented from leaving the work camp. The blockade organizers protested the lack of NCN members employed at the site and charged that Manitoba Hydro was not living up to promises it made to NCN members as part of the Wuskwatim Project Development Agreement. The end to blockade involved both an agreement with Manitoba Hydro and a court injunction obtained by Manitoba Hydro delivered by the RCMP to the remaining protestors who maintained the blockade after the agreement was reached. NCN Chief Jimmy Moore said that NCN council did not sanction the blockade.